Shenandoah Golf Club is a Jerry Matthews design that opened in 1950. As you might expect from a course of this vintage, the holes are rather straightforward with medium sized greens. Shenandoah is also somewhat disjointed, which is typical of development layouts. Holes one and two run consecutively from the clubhouse, then players need to pass some houses and cross a residential street to get to the third. Three through seven play consecutively, then it’s back across the street for eight and nine. On the back nine, ten through thirteen come as a package, but fourteen and fifteen require another street crossing. After crossing the same street to get back to sixteen, the final four flow back to the clubhouse. The front nine at Shenandoah is relatively open, but hilly. Six of the nine holes play significantly up or down, and in the case of the fourth and fifth holes, both. The elevation changes are the result of routing that takes five of the holes on a path perpendicular to a boggy creek. Two other holes run parallel to a lake/creek/marsh, which I assume are part of the same watershed. 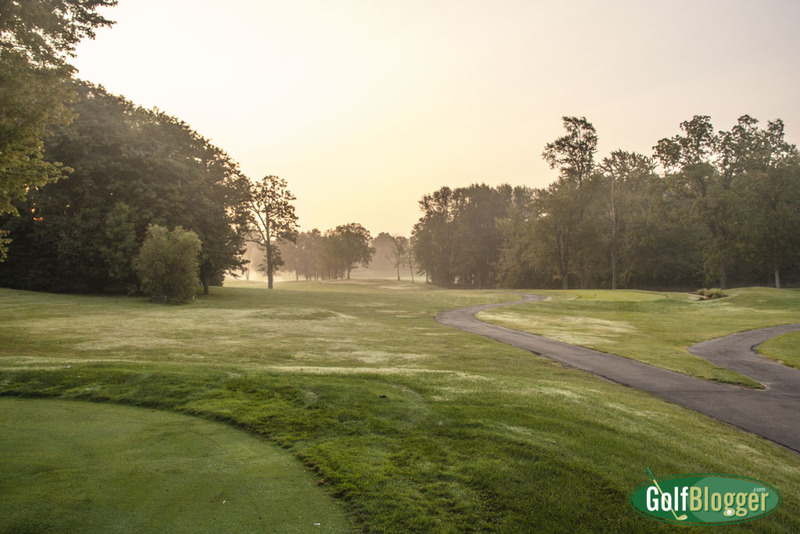 All of the holes are straight shots, with the exception of the par five second, which could generously be described as a dogleg left off the tee. 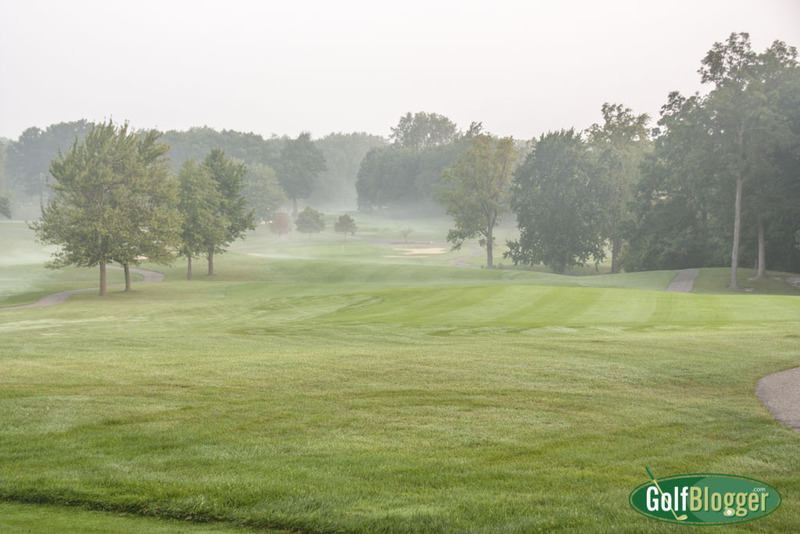 Shenandoah Golf Club’s back nine is tighter, with six tree lined fairways. Only the eleventh, which runs straight downhill from the clubhouse has any elevation which would cause reconsideration of a club selection. Five of the holes have bends which add some interest. Water — or at least marshy areas — come into play on ten of the holes. I counted sixty five bunkers. The strategy at Shenandoah is pretty basic: hit the ball straight. On holes four through seven, it helps to know how far it is from the tee to the creekline and on eleven, how far it is to the bunker on the left. Other than that, the course is all in front of you. 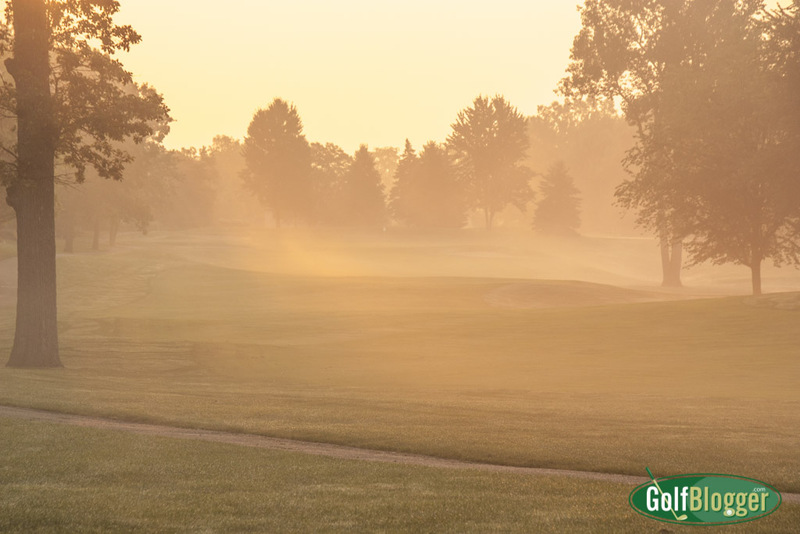 From the back tees, Shenandoah Country Club stretches to 6,558 yards and plays to a 72.1/132. I played from the white tees, which measure 6, 208 and play at 70.7/129. My favorite hole was the par five second. One of the few doglegs on the course, it requires a tee shot to either draw around a stand of trees, or a straight shot short of right-side fairway bunkers some 216 yards out. The second and third shots play slightly uphill to a green nicely framed by trees and protected left and right by bunkers. The photo above was shot directly into the rising sun on a very foggy morning, giving it that red look. Conditions on the day I played were not particularly good. The greens were top notch, but too many fairways had water issues, with soggy, boglike conditions. My feet were soaked by the fifth hole. On several occasions, my tee shots plugged in mud. Bad drainage is not something I complain about on a $20 muni, but Shenandoah is priced at $43 weekdays and $54 on the weekends. The pro shop staff and starter were very friendly, and although I didn’t stop in the clubhouse/banquet facility, it looks beautiful. 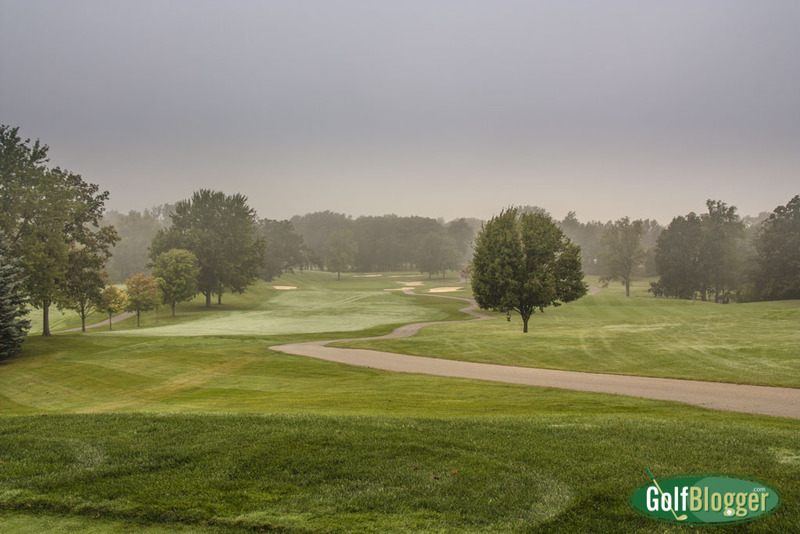 The Shenandoah Golf Course Review was first published September 8, 2015.